More of the British public view Nigel Farage and Boris Johnson as a “leader” of people who back Brexit than they do Theresa May, the Prime Minister supposedly leading the UK out of the European Union (EU). And tellingly, the new poll revealed that more Tories see the former UK Independence Party leader as a head of the Brexit movement than their own leader. Whilst 34 percent said there was no leader of Brexiteers, 15 percent picked Boris Johnson, a key figure in the Vote Leave group who recently resigned as foreign secretary over Mrs May’s “soft Brexit” plan. 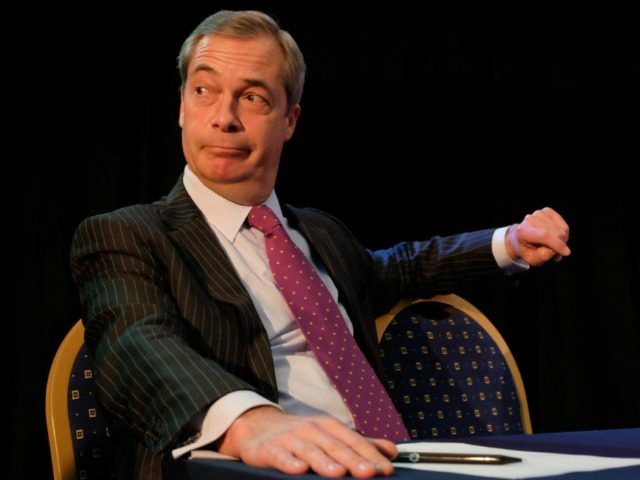 In second was Mr Farage, with 13 percent regarding him as leader of the Brexiteers, who despite never being in government was arguably the most important figure in bringing about the referendum by pressuring the Tories and leading UKIP to success at the polls. Of Conservative voters, 18 percent see Mr Farage as a Brexit leader compared to just 15 percent who see their own party leader, Mrs May, as leading people who want to get out of the EU. Who do you think comes closest to being the ‘leader’ of those in favour of Brexit? Just ten percent of all respondents recognised Mrs May as a Brexit leader, and three percent naming David Davis, the former Brexit secretary who also resigned in protest of Mrs May’s water-down Brexit plans. There is widespread opposition to her Brexit plan, keeping the UK tied to EU rules and regulations, with twice as many Brits wanting a clean exit from the EU than those who want Mrs May’s “soft Brexit”, according to a poll out earlier this week. This may help explain why Mr Farage and Mr Johnson are seen as Brexit leaders, and why the Tory Party recently experienced a slump in voter support as pro-Brexit Conservatives switch to UKIP. A recent opinion poll for the Observer newspaper had Jeremy Corbyn’s Labour Party on 40 percent support with the Conservatives trailing on 36 percent – a six-point fall since the beginning of last month. UKIP, meanwhile, was up 5 points to 8 percent support.